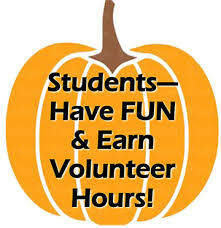 We’re accepting STUDENT VOLUNTEERS for the Pumpkin Festival (must be in 7th grade or older). Volunteers help with children games and pumpkin painting. Limited spaces–volunteers assigned in the order forms are received. Complete the Volunteer Form from City of Huron’s website. Forms are also available at Huron High School Guidance Office.